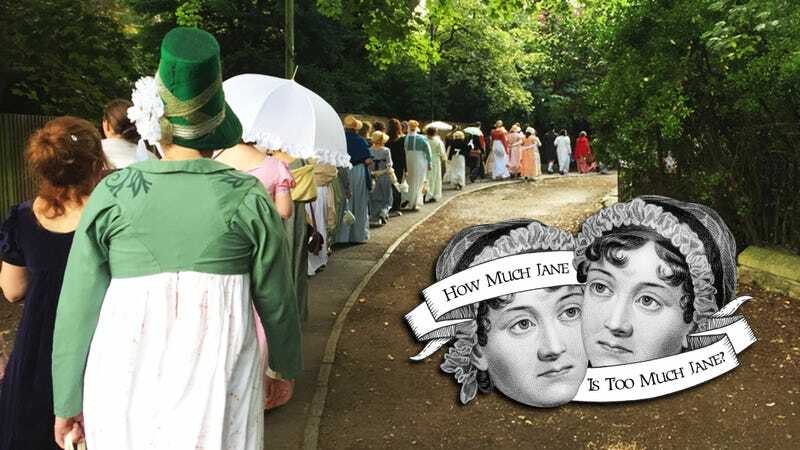 Greetings from Bath, England, where I’m currently attending the fifteenth annual Jane Austen Festival, on the two-hundredth-year anniversary of both the publication of Emma and the Battle of Waterloo, in an attempt to probe the outer limits of my own deep fondness for Austen’s oeuvre. Yes, I am dressing up. Jane Austen actually spent much of her life in Hampshire, two hours away, and they’ve got both her grave and the home where she wrote three of her novels. But that hasn’t stopped Bath from seizing as much of the (substantial) Austenite tourist trade as possible. This historic spa town has carved out a niche for itself as a must-do for fans, with the Jane Austen Centre (complete with Regency Tea Rooms) and the week-long Jane Austen Festival, which has grown into a fairly major event for die-hards. The program opens annually with a Promenade through the streets of Bath. Participants are expected to wear late Georgian or Regency dress. It currently holds the Guinness world record for largest gathering in Regency dress—550—a title regained last year from an American event in Louisville, Kentucky. It’s fitting, really, as Bath was a getaway destination even in Austen’s day. Since doctors no longer send their ailing patients to “take the waters,” a parade in Regency dress will do just fine for the brochures. And Bath does have text going for it: Both Persuasion and Northanger Abbey were set largely in the town, the core of which hasn’t changed that dramatically since Georgian days. So you can easily stroll streets that Austen would’ve known and in fact wrote about. The season was full, the room crowded, and the two ladies squeezed in as well as they could. As for Mr. Allen, he repaired directly to the card-room, and left them to enjoy a mob by themselves. With more care for the safety of her new gown than for the comfort of her protégée, Mrs. Allen made her way through the throng of men by the door, as swiftly as the necessary caution would allow; Catherine, however, kept close at her side, and linked her arm too firmly within her friend’s to be torn asunder by any common effort of a struggling assembly.... though by unwearied diligence they gained even the top of the room, their situation was just the same; they saw nothing of the dancers but the high feathers of some of the ladies. Fortunately, the great ballroom offers a little more elbow room in 2015. There were clearly two groups participating. It takes a certain level of enthusiasm to get outfitted in Regency attire and parade through town, of course, but plenty of attendees were comparatively casual. This quartet (pictured below) has come from London for several years running. Most of them rented their costumes, upgrading every year, but that purple coat on the left is the work of a crafty mom. Then there are the folks that one gets the sense are more thoroughly in the scene. And there is definitely a scene—there are the official Festival events, and then there appears to be a second schedule that’s partly competition, partly after-hours accompaniment. Saturday night, for instance, there was a country dance on the program (£43), but you could also opt for the Jane Austen Grand Regency Ball (£85), which was independently organized by the costumers at Farthingale. These women had come from California, and the one on the right, Jane Xavier Doughtery, actually made that truly spectacular hat. In fact she made her entire costume, replicating a fashion plate from 1815. While there are plenty of American Austen fans and events, “we don’t have anything like this,” she said. After some more milling and a turn or two around the room, we were led out into the city itself. The authorities had actually stopped traffic for the procession. People gathered along the parade route to take pictures, including a cheering gang of Red Hat Society members. It was the most conspicuous I’ve ever felt in my entire life, including my own wedding. Some attendees were die-hards who’d traveled from all over the United Kingdom. There were, of course, Americans, as well as several Germans, and we walked alongside a young man from Hong Kong. But there were also plenty of locals who’d caught the promenade previously and thought it would be something fun. The Bath resident on the right had talked two London friends into renting costumes and coming out for the day, like you’d go to a costume party. The fellow in the middle rather boldly admitted that Jane Austen wasn’t quite his thing, before looking around like he thought somebody might wallop him with a parasol. “How can you not like Jane Austen?” his friend demanded. Tourists routinely snapped photographs with participants. At least one sunglasses-clad pair followed the promenade all the way to the end. After roughly an hour of gentle walking, the procession dumped us out in a park next to the river. The parade had been led by a small group of Redcoats, which added a certain martial flair to the proceedings. These weren’t Austen fans who feel particularly partial to Wickham, but rather Napoleonic-era reenactors—fellow travelers of a sort. I spoke to Kate, part of the 41st Regiment of Foot, based in South Wales. They generally do the War of 1812—“Fight the Americans!” one of her companions piped up gruffly—but they came over to participate in the promenade at the invitation of a Cornish reenactment group. If you’re picturing enormous numbers of women, you’re not entirely wrong—but you’re not entirely right, either. For instance, there was at least one sharply outfitted young man in a beard who inspired second looks from myself and my companion. Nor was he the lone standout. The man on the right and woman on the left have been coming in costume since 2009. It was her idea, after spotting an ad in the magazine Jane Austen’s Regency World. “I’ve got to do this,” she thought. So he asked her to whip him up costume, as well. “It’s fantastic, the atmosphere of meeting the people, the effort that’s gone into the outfits,” he said. Only, “you can’t put this stuff on without becoming Mr. Darcy, whether you like it or not.” Well, does he or doesn’t he? “I think I’d prefer to be Willoughby, actually.” Willoughby being, of course, the charming bounder who breaks Marianne Dashwood’s heart in Sense and Sensibility. She was with fellow history-of-fashion enthusiast Cathy Hey, who runs the costuming resources Your Wardrobe Unlock’d and Foundations Revealed. Her dress was designed to resemble a famous highlight of the Victoria & Albert’s collection. “It took twenty years to find the right fabric. It’s got to be the right print,” she explained. So we retraced our steps to the Jane Austen Centre, getting a tongue-in-cheek wolf whistle along the way, and sat down to Sparkling Tea With Mr. Darcy, presided over by an oil portrait of Colin Firth in character as Mr. Darcy, from the BBC’s Pride and Prejudice. I’ll be here all week, going balls deep (literally, I’m going to a ball) in Jane Austen, endeavoring to discover whether it is in fact possible to drown in Jane Austen. Please stay tuned.